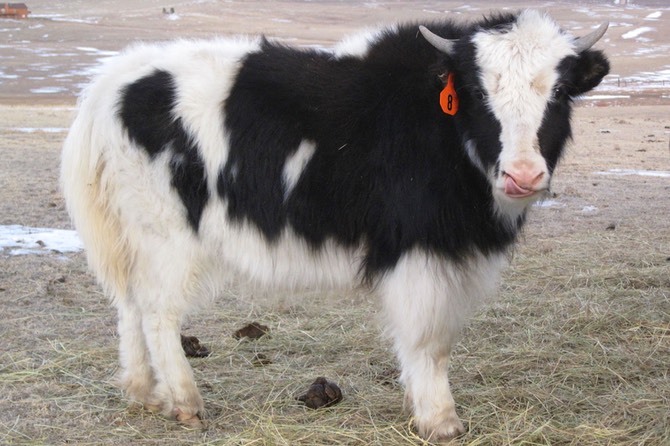 Three colors are recognized in North American yaks: Imperial Black, Native Black, and Blackish. Native Black: Native Blacks are black hided animals with a grey or brown muzzle. Some individuals will show a grey or grizzly dorsal stripe, which is considered by some a more ancient wild-type trait (Weiner, G., 2014). Native Blacks vary from a near dark black to brownish. Golden: Goldens have, you guess it, a golden honey brown color, but can vary from light red to a more brownish red. These beautiful creatures are rare and the gene that creates this color is recessive, which some believe they are the remnant of nomadic cross-breeding with cattle. Recent genetics research by IYAK and collaborators at University of Nebraska confirm this. Beautiful but research shows Goldens are not true yak and carry bovine genetic mutations of the Highland cattle that causes the golden color. Oops, not a true yak, and not something to preserve, promote and protect. A Highland hybrid. Enjoy. Don’t breed to dilute the genetically strong North American Yak herd. The Research is In: White yaks aren’t really yak. White yak are always a genetic mixed of yak with cattle - much like Golden/Highlands (above). White yaks are more common in Asia, but whether in North America or on the Tibetan Plateau, researchers agree there is only one way to get a white or golden yak - hybridize. Hybridization is the controversial practice of mating two different species that do not normally mate to derive new genetic characteristics. You probably didn’t know, another research study in 2015 shows that yak are more similar to bison than white yak. This means, Tianzhu white yak are less genetically similar to yak (Bos mutus gruinnins) then are the American Bison (Bai, J, et al., 2015). Which is odd because bison are our closest relative, and they are an entirely different species (Bison bison). Tianzhu white yak aren’t really yak - researchers say they’re more similar to Bos taurus. So, White yak are more cattle than yak if you look at the whole genome. Beautiful but not true yak. Another study in 2012 demonstrated that there were known cattle mutations that occur to create the white coat color (Qui, Q, et al. 2012). This is important because it is the result of 2 species crossing (Bos mutus gruinnins x Bos taurus or Bos indicus) - creating a hybrid species. Not exactly a yak. These hybrids are are helpful to ranchers breeding yak for meat or fiber production, but these terminal animals should not be bred themselves. You may have head the term Genetic Pollution bandied about in the media and by Conservation Biologists at the United Nations. Genetic Pollution is used to describe gene flows between modified or domesticated species and their wild relatives. The opposite of Genetic Pollution are True Genetic Breeds. These True Genetic Breeds are important to folks protecting Heritage Breeds, like the Livestock Conservancy — because well — extinction. Non-hybriidized yak are threatened globally. So just don’t. There are three yak color patterns in North America; Solid, Trim and Royal. Solids: Solids are completely black or brown with no white patterns. Trims: Trims typically display a white star or stripe on their forehead. Rear legs, and sometimes all four legs, have white socks and 1/3 to 1/2 of the tail will be white. We have seen full white tails in Trims which is considered a wild-type ancestral remnant (Wiener, G. 2014). The amount of white does not determine if the animal is a Trim; even a small expression of white qualifies the animal as a Trim. There are three Trim colors: Native Black Trim, Imperial Trim and Golden Trim. Royals: Royals exhibit a piebald pattern with a pink muzzle and tongue. They are black and white or gold and white. They usually have a full white tail and piebald pattern throughout the torso with white usually continuous under the belly. The face usually has a broad white stripe. The amount of body white varies significantly from about 10% to less than 90%. On occasion we will see some very small spots, but never a true roan. Some people have referred to this pattern as a Holstein type pattern - descriptively vivid but erroneous. These beautiful creatures are rare and some believe they are the remnant of nomadic cross-breeding with cattle. More genetics research by IYAK is needed to see if this is the case in our registry. Imperials are either homozygous Imperial or heterozygous Imperial. Only one copy of the Imperial gene is required for the Imperial gene to dominate over the Native Black or Gold colors and produce Imperials. A homozygous Imperial bull will always produce Imperial offspring when bred to Native Black females. When bred to Royal females he will always produce Imperial Trims. A heterozygous Imperial bull will produce a mixture of Imperial and Native Black offspring when bred in the same manner. When you register your animal with IYAK they provide proprietary genetic testing and analysis that gives you information about your yak in comparison to the the entire NAYR herd - this is 2,500 yak registered to IYAK and IYAK historic animals - and the specific genes that your animal carries that influence coat color, etc are based on the IYAK herd. No one else bases their research on IYAKs entire herd, they only have tiny samples to compare to, many of which are small numbers of non-representative hybrids. IYAKs genetics analyses is powerful and can help you reach your breeding goals by letting you know which animals are more likely to give you the desired outcome and which you should cull. For more information see Reading Your Genetic Registration Report (here) and IYAK Genetically Outperforming Tibetan Yak (here). Nicole Porter-Salvato, PhD is one of the caretakers and founders of Prairie Sky Sanctuary, a horse and yak ranch in SW Wisconsin. She’s trained in epigenetic and epidemiology, an avid IYAK supporter, BOD member and yak lover. She and her husband, Dan, love to talk about yak and are always available to answer questions or provide resources.